south of Portland, Oregon. Owned and operated by the United Church of Christ, Camp Adams is available to United Church of Christ member and non-member organizations. Every summer, youth who have completed 2nd grade and up look forward to a week at Camp Adams which features a swimming spot, nature walks, a ropes course, crafts, all meals, nightly campfires and an outdoor worship area. In the fall, Riverside members also make a yearly all-church trip to Camp Adams. For the past 60 years Camp Adams has provided Oregonians with a unique outdoor facility. 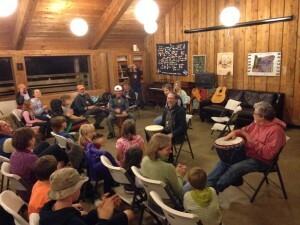 The camp hosts everything from Outdoor School for students in Oregon’s public schools to spiritual retreats offered by area churches. Visit Camp Adams Website for more information.